As you may guess, the title is a city in Australia. But, isn’t this an Iranian film? Just hold on….there’s a reason. 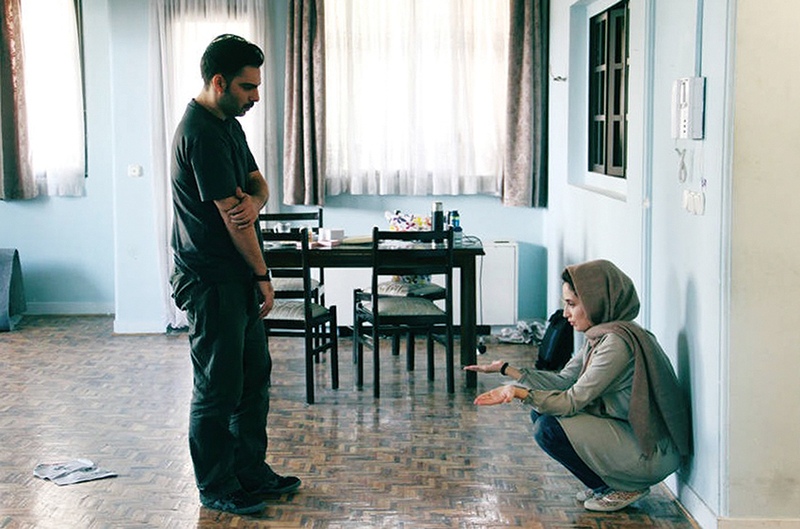 Yes, “Melbourne” is an Iranian film and actually a tremendous directorial debut for Nima Javidi, who also wrote the film’s taut and affective screenplay. In fact, this effective absorbing domestic drama has a storyline that builds to a level of nail-biting tension that you’d usually find in a thriller. In a way, the film could be considered a thriller, in that it will invoke an intense response from viewers, finding them with a lingering “what would I do?” question throughout the film and easily providing lively post-viewing conversations. “Melbourne” is truly one of the most memorable discovers of the recent Iranian films I’ve seen, playing this month at Chicago’s Gene Siskel Film Center. 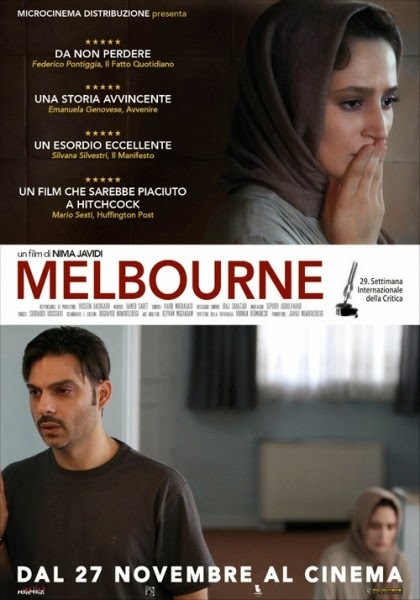 Melbourne is the looming destination for the two central characters Amir (Peyman Moaadi, “A Separation”) and Sara (Negar Javaherian) we follow in “Melbourne”. The young middle-class married couple have chosen to emigrate there for approximately three to four years to study there and we meet them on the day they are scheduled to depart. We learn about their travel plans early on as they are visited by a harried census worker. As they buzz about their Tehran apartment – settling things with the landlord, canceling utilities and selling off their wares – family members and neighbors come and go to offer their farewells. Not all of them understand the couple’s decision, but they nevertheless wish them well. Amid the hustle and bustle and the stressors of exiting their homeland, Amir and Sara are halted and derailed by a tragedy that will change their lives forever. It will also reveal who these characters are, for better or worse. To reveal anymore would do a disservice to you as a film enthusiast and will lessen the impact the film will have, but as it is explained in the film’s summary, the tragedy involves a neighbor’s newborn girl who Sara has agreed to watch for a while as they get ready to leave. Think of that what you will, but by no means read up on any further details anywhere else online. Just know this – Javidi has crafted a wholly gripping premise that is executed in a manner that feels authentic and natural, however you feel about the actions of the characters. Questions are raised – by the couple and by us as viewers. Some of these questions begin to merge, as both the couple and the audience will no doubt wonder the same things. Like the couple, we try to imagine where each decision and lie they make will lead to – all in the aftermath of what is probably one of the worst possible scenarios imaginable. During the entire viewing experience, I could not get out of my head how Javidi presents the central crisis in the most organic way. There are some clues and revelations offered, as new character’s are introduced – like the baby’s father (Mani Haghighi) and nanny (Vida Javan) – but nothing ever feels forced or heavy-handed. Javidi’s screenplay unfolds like that of a master suspense novelist, which means we can’t look away despite how emotionally exhausting we become. Of course, the two lead performances from Moaadi and Javaherian are phenomenal. This is a film that relies on strong work from its two leads and that’s what we witness here. Their work here is challenging, portraying characters in a morally complex situation, but the emotions they convey feel raw and real. It may seem to some viewers that their dilemma could be easily resolved by simply notifying the authorities, but that’s viewers imagining what they would do and we really never know what we would do in a tragic situation until we’re in it. It’s hard to be critical of Amir and Sara when it’s a challenge to say what exactly we’d do in their situation. The final scene with the two of them in the backseat of a vehicle, internally taking all we’ve seen them go through is one of the most powerful cinematic scenes I’ll see all year. Javidi, who apparently is drawing much of the premise from a ‘what if?’ scenario spawned from his own mind based on an experience he had when he was left to watch over his friend’s baby, touches on a universal fear here and does so in a very engrossing way. He’s showing us real life, honest reactions and inevitable consequences. I’ll certainly be following his career from here on out. “Melbourne” debuted at the Venice Film Festival in 2014 and has been working the festival circuit since – understandably receiving acclaim. This is definitely a film worthy of strong word-of-mouth. Seek it out and find out for yourself just how great this film is. In Chicago, it’s playing one more time this afternoon, get tickets here.